It just goes to show … fact can sometimes be stranger than fiction ! 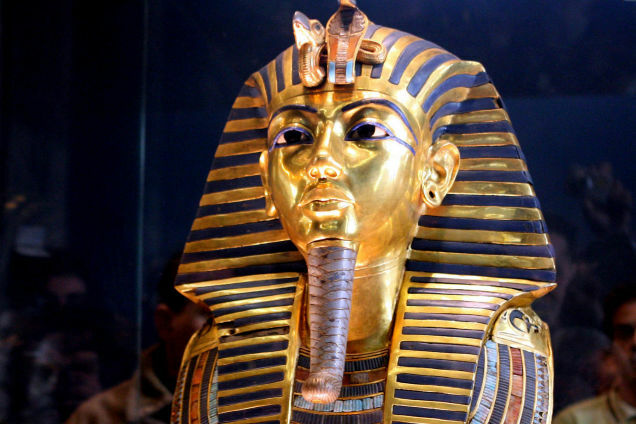 Yesterday, 22 January 2015, the story hit the world’s headlines that the famous death mask of Tutankhamun, on display at the Egyptian Antiquities Museum in Cairo, was allegedly damaged last year. The blue plaited beard was apparently knocked off. A botched repair job appears to have been undertaken to glue it back on with epoxy, leaving a discernible line of glue. To make matters worse, it’s reported that attempts to scratch off the visible glue inflicted more damage. There are conflicting reports about whether the damage was purely accidental, or whether the – detachable – beard was knocked off during cleaning. A committee has now been set up to investigate exactly what happened. Whatever the truth or real circumstances of what happened, this story raises all sorts of questions about the protection, care and preservation of Egypt’s ancient artefacts in the years since the revolution that removed Hosni Mubarak in February 2011. My series of novels following Meredith Pink’s Adventures in Egypt has many scenes set at the Egyptian Museum in Cairo. A couple of my key fictional characters work there. I suspect had I included something like accidental damage to Tutankhamun’s death mask as part of one of my stories, I’d have been told it was too far-fetched and could never happen. These reports just go to show that truth really can be stranger than fiction ! We can only hope the investigation will get to the bottom of what really happened, and lessons will be learnt. Author of Meredith Pink’s Adventures in Egypt – available on Amazon. Posted on January 23, 2015 by Fiona Deal. This entry was posted in ancient Egypt, Egypt, egyptian fiction, fiction, History, Travel, Uncategorized, writing and tagged Cairo Museum, death mask, egypt, investigation, Meredith Pink, Tutankhamun. Bookmark the permalink.